Chinese contemporary artist, Ai Wei Wei, and the Chinese government are like oil and water. The two have been going head to head for years. With his tools of social media and art, Wei Wei is a fighter who refuses to leave the ring. Born in 1957, Ai Wei Wei was raised in a labour camp in Xinjiang. His father, Chinese poet Ai Qing, was denounced during the Anti-Rightist Movement in 1958 and the labour camp was home to his family for the next 16 years. What the Chinese government couldn't have anticipated was that Ai Qing's son would come back with a vengeance. His art became his platform and the world and social media became his audience. When Weiwei didn't attend the opening ceremonies at the 2008 Olympics in Beijing, there was confusion. Where was he? He had designed the now famous "Bird Nest" stadium for the games and suddenly he was nowhere to be found. The Chinese government wanted him to smile for the international media to show the world that China had changed politically. Weiwei later admitted he regretted designing the stadium, saying the 2008 Olympics were merely a "government-controlled "empty event" not shared by ordinary citizens." This wouldn't be the last time Weiwei would speak out against the Chinese government. In the wake of the 2008 Sichuan earthquake, Weiwei publicized the poorly constructed schools that collapsed during the earthquake. It is widely believed the poor construction of these building is due to official corruption on the part of the government. Over 5,335 school children died. The events inspired Weiwei to produce "Remembrance", a wall of Chinese text made from children's backpacks that covered the facade of the Haus der Kunst in Munich, Germany. The text read: "'She lived happily for seven years in this world." ;the words of a mother whose daughter died in the quake.He also "compiled a list of the names of the children who died, and accused the government of exacerbating parents' grief with official denial." Photo posted on Weiwei's Twitter following beating. Embarrassed on the international political stage, the Chinese government lashed out. It started surveillancing Weiwei and after following him home one late night in September 2009, Weiwei was struck in the head by a government agent. Refusing to go quietly, Weiwei took to his twitter to ensure this wouldn't be another incident that the government could erase. He took his photo after his beating and posted "I don't want the next generation to fight the same fight as I did". The blow to his head was so severe he was rushed to hospital days later. Weiwei had a brain hemorrhage. 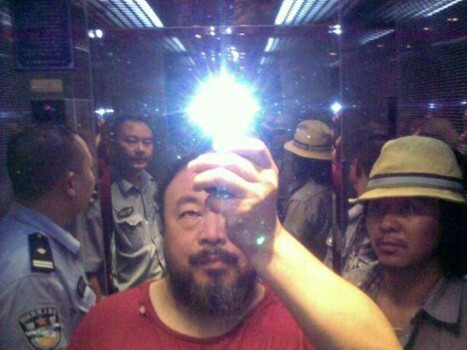 After Weiwei refused to step down, the Chinese government destroyed his Shanghai studio in 2011. It took two years to build and only one day to take down. Undeterred, Weiwei made an installation piece out of the debris. He called it his best piece to date and slyly thanked the government for it's help. Later on that year, he was detained for 81 days at an unknown location after he was stopped at the Beijing airport on route to Hong Kong. The government said he was the voice of treason and demanded he admit to his crimes. Weiwei's story is one of courage. In the face of a corrupt government, he continues to stand firmly by his beliefs. With his art, he tells a story of what happens behind the borders of China. He is a selfless artist who utilizes his work to tell the stories of others in the hopes that future generations won't have to fight to step out from the shadow of the Chinese government. To learn about about Weiwei story and strong spirit, check out the new documentary, "Weiwei, Never Sorry".